Wherever he goes with Madness, from the Queen’s roof to the Olympic Stadium, he’s part of British music heritage. Now Lee Thompson is doing a bit of moonlighting to introduce another generation to his favourite Jamaican flavours. Prepare for a ska and reggae knees-up. El Thommo, sax player with Madness and co-writer of some of their timeless best like House Of Fun, Embarrassment and Lovestruck, has put his own orchestra on record. Lee has turned his occasional gigging pastime of the past two years into a new album, and it’s more fun than should be legal. The album features treasured tunes from Lee’s collection, inspired by the recordings of personal heroes from Desmond Dekker to Byron Lee — and who better to bring them to us than Thompson, the man who helped introduce an entire generation to ska music when Madness burst into our brains nearly 35 years ago. Lee it was who who wrote Madness’ debut single The Prince, a tribute to the king of ska himself, Prince Buster. Lee is as much a nutty boy as ever, starring in their unforgettable appearances at the Diamond Jubilee concert and the London Olympics closing ceremony. He was part of the Madness street party at the Olympic Stadium just a few weeks after playing Buck House, in the middle of one’s street. That royal appointment is where he got pinched on the cheek by Elton John (“facial, mind you”) and bumped into Stevie Wonder in the Queen’s loo (“I went ‘Steve! Thank you for the music!’, what was I going to say?!”). Thompson is also all over Madness’ most recent UK top ten outing, 2012’s Oui Oui Si Si Ja Ja Da Da, for which he co-wrote the track Circus Freaks. Co-produced by Mike Pelanconi, aka Prince Fatty, at The Ironworks studio in Brighton, the sessions were fast and friendly. “Some of the chaps have got proper jobs, of course, so I was trying to work the recording sessions so that they’d suit everyone. I think we recorded, mixed and had it in the bag over four or five weekends. The album also benefits from the guidance as executive producer of a man with a cast-iron connection to Madness: Dave Robinson, co-founder of Stiff Records, who signed the band to the legendary label in 1979 after famously auditioning them at his wedding. “I didn’t even know how to tune a saxophone then,” Lee laughs. Mike Pelanconi’s album production brilliantly recreates the live vibe of Studio 1 at its most glorious, on tracks inspired by Desmond Dekker, John Holt, Byron Lee and Don Drummond, alongside great versions of King Curtis’ Soul Serenade and Lalo Schifrin’s Mission Impossible theme. Dekker’s mighty, mystical Fu Man Chu gets a vocal transfusion from reggae hitmaker Bitty McLean. Even on songs that originate beyond Jamaica, they were inspired by the ska versions of them. “Soul Serenade, I always thought Byron Lee wrote it, but delving in, it was King Curtis, who’s a massive influence on me,” says Lee. Similarly, Hot Reggae is based on Byron Lee’s adaptation with the Dragonaires of James Brown’s funk classic Hot Pants. The Ska Orchestra’s take on the Allman Brothers’ southern rock staple Midnight Rider nods towards Paul Davidson’s late 1975 UK top ten reggae adaptation, and even their version of Fats Domino’s Hello Josephine acknowledges how the great New Orleans piano man’s music impacted Jamaican culture as well as Lee’s own upbringing. Thompson’s love of ska is part of his musical DNA and has played a huge part in the widely-adored Madness sound. 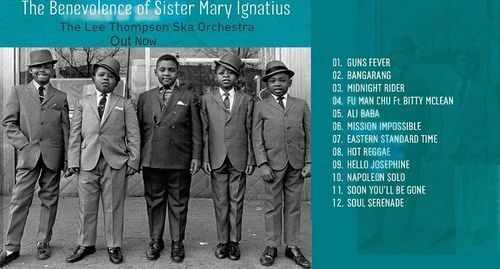 It’s even there in the title of his new project, which tips its hat to Sister Mary Ignatius, who played such a vital role in the development of ska and reggae as head of the Alpha Boys’ School in Kingston, Jamaica. Sister Mary nurtured the talent of several future giants of ska, from trombonist Don Drummond (whose Eastern Standard Time is one of Thompson’s covers of choice), Skatalites founder and trumpeter Johnny ‘Dizzy’ Moore and another trombonist beloved of any fan of the Specials’ 2-Tone sound or Jools Holland’s Rhythm & Blues Orchestra, Rico Rodriguez. Ah, yes, Thommo’s singles collection. “I found a place in Upper Street, Islington, it was like an Aladdin’s cave,” he says. “Firefly, Crab, Punch, all those obscure record labels. I don’t know why they were down there, they were still in brown paper bags and they were a tanner each. I mean, two and a half pence each, or if you bought 10p’s worth, you got an extra one. And another Ska Orchestra album? Not a nutty idea at all. “We’re getting on really well, so hopefully I’ll put my hand in my pocket and do it again,” says Lee. You have to add, on the evidence of The Benevolence Of Sister Mary Ignatius, be our guest.